We live in farming country, with our property almost bordering a very large field/paddock. (See http://lisaandroger.com/2009/05/our-farming-neighbours/). 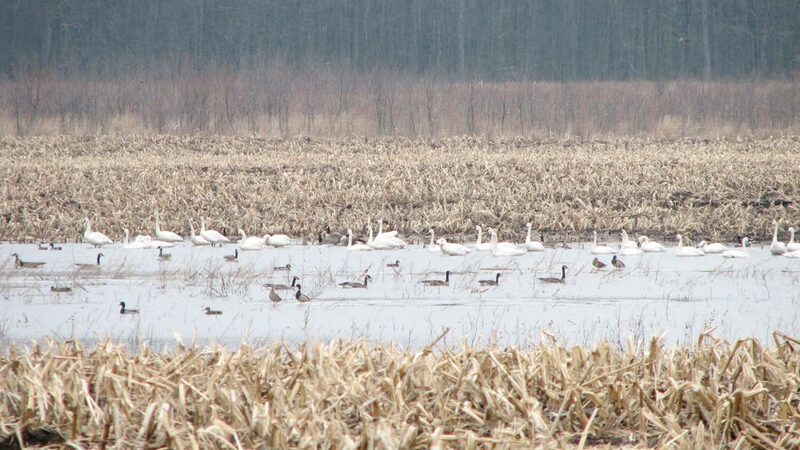 Today as I went by I noticed a flock of large white birds circling over the corn field – turns out they were swans. A large number of waterbirds on a pond in a corn field near our house. shows a shot of the nearest pond, with Mallard ducks, Canada geese and the white swans. I’m not sure if they are Tundra Swans or Mute Swans – both are indicated as being present in Michigan.